The Spine Practice is located at one of the largest not-for-profit hospitals in the Western US. 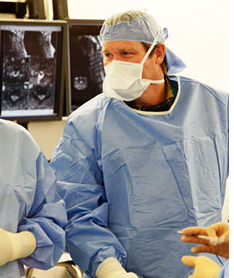 All of our physicians hold titles as Directors or Associate Directors at the Spine Institute. The Spine Practice is an internationally recognized comprehensive spine center dedicated to the evaluation, diagnosis, and treatment of the entire spectrum of spinal column and cord disorders implementing such cutting edge technology as movement preservation with artificial disc replacement , robot assisted surgery, minimally invasive techniques for treatment of fractures and disc disease as well as traditional treatment of common disorders such as deformity and scoliosis, degenerative disc disease, herniated discs, metastatic and primary tumors, congenital abnormalities, trauma and axial skeleton pain. For nearly a decade Spine Practice Physicians have provided state – of – the – art care with both experienced spine surgeons and physicians specializing in non-surgical treatment in order to encompass the entire arena of both operative and non-operative spinal care. Physician office visits, radiographic imaging, physical therapy, non-operative and postoperative care, and surgery are all centrally located for patient convenience and transition of care. Internationally known board certified surgeons and nonsurgical physician spine specialists affiliated with the Spine Practice encompass all spinal sub-specialties including orthopedics, neurosurgery, anesthesiology and physical medicine. Our surgical staff is composed of fellowship trained, published, academic physicians who are involved in development of innovative in research, new techniques, and education for patients and the medical community . The combination of superior extensive training coupled with academic critical peer review supports improved outcomes and provides management of even the most complex cases. The Spine Practice multidisciplinary approach allows patient streamlining from the referring physician office to the appropriate facility for a very effective treatment module from referral to treatment and ultimately postoperative rehabilitation, if surgery is indicated. Conservative Management: In cooperation with pain management and rehabilitation specialists, the Spine Practice offer comprehensive nonsurgical options with the collaboration and expertise of physiatrists, anesthesiologists, psychiatrists, psychologists, chiropractors and acupuncturists to treat both acute and chronic pain, depression and insomnia. Adjunctive treatments are also available by licensed physical therapists, physical therapy assistants and registered occupational therapists. Surgical Services: For both adult and pediatric patients requiring more intensive treatment modalities for herniated discs, degenerative disc disease, deformity, scoliosis, fractures , primary and metastatic tumors, vascular malformations and congenital disorders, the Spine Practice offer the full range of treatment options from minimally invasive, artificial disc implementation with motion preservation, endoscopy, computer aided stereotactic and neuro-navigational technology to standard surgical options. Percutaneous (thru the skin with minimal scar and needle size entry sites) fusion techniques as well as minimally invasive treatment of fractures (kyphoplasty) are also available. Pediatric: In cooperation with nationally recognized centers of ecxcellence, the Spine Practice provides comprehensive spinal programs, care and treatment for both pediatric neurosurgery and orthopedics. Cancer/Oncology Services: based at one of the leading tertiary centers in the United States for both primary and metastatic spinal tumors. 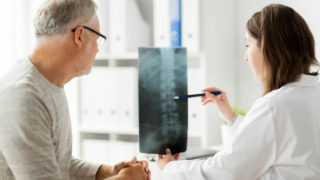 In conjunction with a multidisciplinary approach that includes a tumor board attended by a combination of our spinal surgeons, plastic and reconstructive surgeons, and the hematological/oncological physicians allows for an interactive relationship that allows for identification, treatment instigation and surgical treatment, if indicated , to preserve neurologic function. In addition to providing conventional therapies , the Spine Practice offer new technologies such as minimally invasive surgery and image guided navigation systems. Spine Practice work with a nationally recognized center that ranks among the top 10 non-university hospitals nationwide receiving research funding from the the National Institutes of Health. The Clinical and Basic Laboratory Research Center has enabled our researchers to explore new horizons relating to lumbar and cervical artificial disc placement with motion preservation, guided biomechanics lab, tissue engineering , as well as , image and computer guided/assisted surgical techniques for greater accuracy and potential telemedicine applications. Current clinical trials with the ultimate benefit of more effective treatment to alleviate neck and back pain for cervical and lumbar disc disease include artificial disc placement (prosthesis), blood conservation, newer less invasive fusion devices and robotic assisted surgery. Active development of robotic surgical systems and specialized imaging equipment that will markedly decrease the amount of radiation used in routine spine surgery making surgery safer for patients and surgeons are ongoing. Exploration of new molecular biology therapy that may reverse traumatic cord injury as well bone fusion substitutes like BMP, other stem cell research and more efficient modules for bony fusion that will mean less surgery, faster recovery periods and decreased blood loss. The Spine Practice is dedicated to not only sharing new technology and knowledge with the wider medical community but also intimately involved in teaching and training visiting surgeons with the latest techniques as evidenced by our continuing medical education conferences and symposiums. Our staff routinely publishes in nationally recognized neurosurgical and orthopedic journals, and lecturers at national surgical conferences and symposia. We often work with media when expert opinions are needed. The Spine Practice physicians/surgeon team is dedicated to academic excellence and our members are experienced fellowship mentors with a combined teaching history of many decades. The rich teaching environment allows the Spine Practice and ISD staff to share their expertise and experience to continually improve the quality of spine surgeons in both the private and academic arena. The result is a superior training setting that promotes new technology, better patient care and treatment in an academic setting.